Since I've been trying to "spice up my salads," I've tried to become more creative in toppings, dressings, etc. In fact, I've become one of those people that likes to make their own salad dressings (hey, it's healthier, right?!) When my parents came to visit a few weekends ago, we went to this popular pizza place in downtown DC and my mom ordered this delicious creamy peppercorn salad. I've been dreaming about recreating it since. It's almost just as good, and perfect with a wedge of head lettuce. I've listed the recipe for both the salad and the dressing below. P.S.- Find my other recipes for salads here! Place all of the ingredients in a medium bowl and whisk until combined. Refrigerate in a container for up to 4 days. OMG! 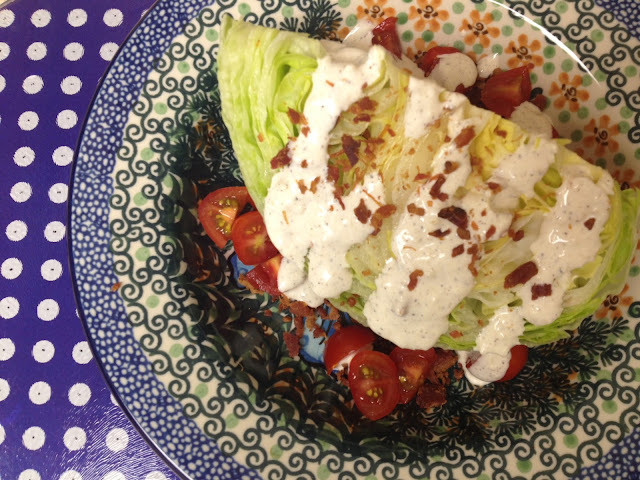 I have recently discovered BLT salads (I know, I know) and I am all about the dressing now! This looks amazing! I love the one at Cheesecake Fact. but it's always dripping with dressing. Trying yours.